Lars-Erik Larsson is one of those composers whose reputation struggles to achieve the status it deserves outside his native country. Discs of his works are sporadically released without ever achieving the 'critical mass' of his oeuvre to allow listeners to gain a substantial knowledge of his music and its range. All the more reason then to warmly welcome this excellent disc both for its individual quality and the fact that it is entitled "Orchestral Music - Vol.1". CPO are remarkably adept at unearthing little-known, indeed unknown, music. Larsson has not suffered from that degree of popular ignorance but instead the fate of having a reputation based on a couple of appealing but slight works. The excellent liner - thanks goodness CPO have finally jettisoned the poorly translated psycho-babble notes that marred so many fine releases - places Larsson firmly at the centre of Swedish musical life but points out that his brand of Classical Modernism was at odds with the more fashionable progressive trends in music. As with many other composers whose music remained essentially tonal this led them to being judged as reactionary at best. Now nearly thirty years after his death we can appreciate the sheer craft and appeal of his music as well as recognising - hence the need for a wide-ranging survey - that he was not simply the pedlar of soft-centred lyrical trivia. Much as I admire the CPO catalogue I would not say their reputation is based on superb sonics as well as repertoire in the way that say BIS or Chandos is. However, this disc is right up there with the best of those and other companies. It is a hybrid surround sound SA-CD but even in the standard CD format I listened in this is a technically excellent disc. The soundstage is wide and deep, the hall acoustic contributing to the beauty of the orchestral sound. My only surprise is that CPO have held it in their vaults for over three years before release - perhaps to allow the performers to put other discs 'in the can'? Andrew Manze, who I still indelibly associate with Baroque Period Violin Performance, proves an adept guide in this repertoire and the Helsingborg Symphony Orchestra are skilful and committed performers. As indeed they were for BIS under Hans-Peter Frank for whom they recorded the three Larsson Symphonies on two discs with the Gods in Disguise Suite the only filler (BIS-CD-426; BIS-CD-96). 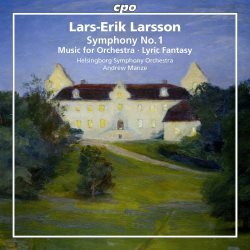 If you have those discs and are not interested in the wider range of Larsson's work then it would be wrong to suggest that they are superseded in musical terms by this new disc and require replacing. Indeed the BIS performance of Symphony No.1 has considerable merits of its own. I had to do a slight double-take when I realised that the BIS disc is now 25 years old - a fact that rather underlines my point about the sporadic nature of Larsson recordings. Both were made in Helsingborg Concert Hall but using very different styles. BIS favoured a slightly distant, naturalistic/concert hall style with CPO preferring a much closer, almost opulent sound-stage. Although timings are fairly similar Manze favours a wider expressive range willing to push on at one moment or relax and expand the next. Overall, Frank is cooler, more objective. To be honest I like both approaches musically and technically and am glad to know both. For an apprentice work - he was just 20 when it was written - Larsson's Symphony No.1 is highly competent and full of confidence. Liner-note writer Christoph Schlüren identifies the influence of the early Sibelius Symphonies and Carl Nielsen. To that I would add more than a hint of Stenhammar. This is not as strikingly individual a First Symphony as say Shostakovich or indeed Nielsen but it is an easily assimilated and enjoyable work. The Finale is probably the least successful movement as it struggles to reconcile a sense of drawing together all that has gone before with some rather note-spinning sequences. Certainly in contrast to the beautifully elegiac Adagio or the open-air joyfulness of the Scherzo there is a sense of it being 'worked-out'. By the time Larsson came to write the next work on the disc, nearly a decade later, he had perfected the tenderly lyrical and intimate style that would define his music for many. The Four Vignettes to Shakespeare's The Winter's Tale are drawn from his incidental music to that play. Again my comparative version comes from BIS this time played by the Stockholm Sinfonietta under Jan-Olav Wedin (BIS-CD-165). By BIS's standards this is a slightly edgy and close recording so the mellower CPO version is clearly preferable. This is an absolute charmer, each of the four movements essentially reflective - only the elegiac closing Epilogue builds to anything like a climactic passage - and the shade of Sibelius is a benevolent presence. Interesting to read in Schlüren's note that Larsson dabbled with 12-tone composition. Certainly the sinuous and tonally ambiguous Music for Orchestra Op.40 shows how far he has progressed from the diatonic certainties of the First Symphony. This is quite austere but never forbidding music again quite beautifully presented here. Manze secures crisp and articulate playing from the orchestra. There is a neo-classical objectivity about the work - I particularly like the bustling fugato allegro molto that dominates the second half of the opening movement - it occupies a very similar sound world to Malcolm Arnold's Sinfoniettas. Indeed the whole work is very impressive with a windingly powerful expressive central Andante elegiaco - a lovely flute solo over gently insistent timpani. The dramatic closing Allegro cannot quite decide if it is good humoured or not. Again superbly articulate playing by all departments of the Helsingborg orchestra revealed in all its considerable quality by the excellent recording. The two works that complete the disc return to the more conventional perception of Larsson as lyrical miniaturist. When they are works of such jewel-like perfection as these that is not intended as faint praise. The first of these is the Pastoral which again is drawn from a score written for the theatre. This is very much in the style of Dag Wirén's charming String Serenade with more than a hint of Nielsen's Little Suite for Strings. Music that might be deemed 'light' but with enough teasing harmonic and rhythmic side-slips to lift it out of the routine into the delightful. In a clever piece of programming the disc ends with a work from late in Larsson's career: the Lyric Fantasy. Thoroughly out of touch with the time in which it was written - 1967 - this is a masterly display of skill and sophistication masquerading as simplicity. I am not sure you could compose something of such direct and uncomplicated utterance if you had not worked your way through large and complex gestures first. Indeed, what marks out this disc is the way in which each piece increases and refines the listener's knowledge of and appreciation for the work of Larsson. A quite excellent disc in every respect and one that leaves me impatiently looking forward to Volume 2.